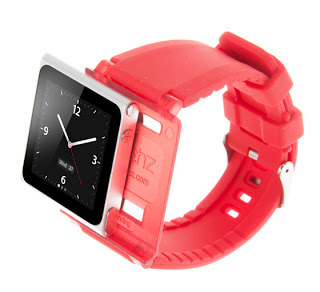 The world is crazy with I Pods and whatever comes with I pod becomes a hit.. now its Watch strap. , Some crazy guys created this business model(where do these people come from.) .. The watch Strap for I Pod nano and its a hit. I Pod Nano is an another different(!?) apple product, Its small, square and of course that's the different. I Pod Nano have some basic apps and one of an app is this clock app. With this app I Pod Nano looks like a watch and that's it. Some one made a strap. Iwatchz.com is a dedicated watch strap selling website. Have a good bunch of designs,colors and they've named their collections like Time Piece,Q2,carbon and on. The watch straps looks cute and elegant. I'm sure many will buy I Pod nano for these watch straps.